I have a ceramic sink which I want to remove - how do I remove it without damaging the area? 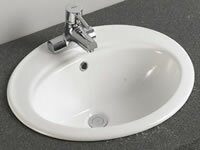 Your sink is likely to be glued into place, in which case you will need to carefully extract it from its surround. Begin by disconneting your water supply and removing all the plumbing connections. You probably wont need to remove the actual taps, but t wont hurt. Be very careful about using hammers as ceramic sinks do not tend to react well to them! I have a ceramic sink which I no longer need - what should I do with it? If it is a large and deep sink such as a belfast sink, one ofhte very best things you could do is to use it as a trough for growing your vegetables in. As well as the asthetics of this solution, it is environmentally friendly and it is also, believe it or not, an excellent environment for putting your soil in. Could I sell my ceramic sink on e-bay? This is certainly another option, although you should be realistic about your expectations. Unless the sink is in perfect condition yo are not likely to get much for it. Also, given the weight-to-value ratio of an old ceramic sink, it will probably only really be viable to sell it as a 'buyer collects' item - there is no point spending £30 shipping a £10 sink to the otehr end of the country! I have another question, to whom should I address it? Our site is still relatively new and we would love to add to this section over time, so please do feel free to send in your questions - we would be delighted to hear from you - send your questions to info@ceramic-sinks.co.uk.